I am werary of hearing whether you should stand or kneel during the National Anthem. It is all over social media these days. Everyone has an opionion. I am sure you have read all about it too. To stand or not to stand for the National Anthem – that is the question. So what do you think? 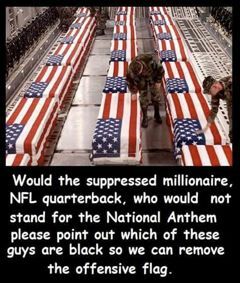 Stand or kneel for the National Anthem? I looked up some history on the National Anthem in the US – The Star Spangeld Banner. The National Anthem was written in 1814 by Francis Scott Key. 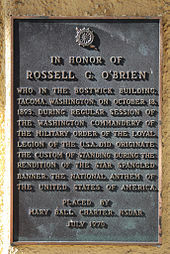 President Herbert Hoover signed the bill that made the song the national anthem in 1931. I am in the camp that STANDS when the National Anthem is played. I STAND during the Pledge of Allegiance too. It’s all about honoring our fallen heros for me. It’s about taking a moment of time and saying thank you. It’s not about wheter things are hunky dorie for everyone everywhere – we know that isn’t true in this world. The National Anthem is a time for me to honor those who have died for my freedom. There is nothing to protest in my book – they died. It’s about them and their sacrifice, not about me or my thoughts on things. To make it a protest for this or that is plain disrespectful in my book. My husband is a Veteran. My father in law and his brother is a Veteran. My deceased grandfather is a Veteran. Even my ex-husband is a Veteran. I stand for the Veterans and fallen heros in our land. from Francis Scott Key’s manuscript in the Maryland Historical Society collection. Posted in Activism, Life and tagged America, dishonor, Flag of the United States, football, football players kneel during national anthem, Football protest, Honor, Mark Levin, National Anthem, Star Spangled Banner, The Star-Spangled Banner. Bookmark the permalink. Unless someone is confined to a wheelchair because of a debilitating condition or had sustained an injury like a broken foot or leg, refusal to stand for the national anthem otherwise would offend me personally. Of course, Left wing political types are at war with everything that is great about the United States of America. Diana Rasmussen, as to my reference to an injury sustained that keeps someone from walking or standing independently, even if it was temporary, what are your thoughts? Should this be a legitimate exception for people who would otherwise be happy to stand during the National Anthem but cannot due to a specific injury? Of course, we all do what we can. If you are bound in a wheelchair, you can still stand in your heart. It’s about honor. Some choose honor, some disrespect it. I won’t stand for the song because if you don’t stand for your beliefs then you don’t stand for anything. The writer of this song was an anti-abolutionist. He had no real respect for freedom, especially the freedom of slaves. The lyrics of the song and the purpose of it do nothing to honor our fallen soldiers. I’m a proud Native American. My family was proud to have been a stop on the underground railroad. My husband and sons are veterans. But, we neither salute the flag nor stand for the anthem. It is a symbol of horror for us. While I respect the right of those who stand, they must also respect the rights of those who will not stand for something that stands in the way of their freedom. Who better to bring this to the attention of the world than well-paid athletes who cannot be physically endangered by their legitimate protests. Perfectly spoken! It is totally ridiculous and shameful that overpaid athletes can be so disrespectful to those in real uniforms who have fought to keep us all safe. That’s how I feel about it. I think it’s a reflection on how their parents raised them too. Sad situation.